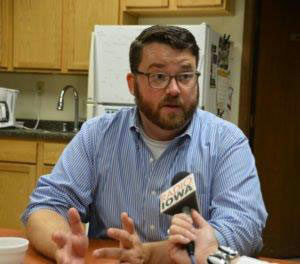 Iowa Democrats have re-elected Troy Price as their party’s chairman. Price has been the party’s chairman since the middle of 2017, when the previous chair resigned for health reasons. The Iowa Democratic Party’s state central committee this weekend reelected Price for a full, two-year run as head of the party. Price has worked for Tom Vilsack when he was Iowa’s governor and on the Iowa presidential campaigns of Barack Obama and Hillary Clinton. Price will be in charge of the conduct of the Iowa Caucuses, currently scheduled for February 3, 2020. The Democratic National Committee has directed Iowa Democrats to come up with ways to ensure people who cannot physically attend the evening precinct caucus meetings to participate in some way. The party hosted “tele-caucuses” in 2016 for people unable to attend a caucus.